Couldn't believe how quickly everything was unpacked. One minute I was surrounded by boxes and within half a day it looked like I'd been living in the house for ages! Thank you so much for helping to aleviate some of the stress of moving house. Would definitely recommend! Dear Vanessa, just a short note to say thank you for the work done by your team at my house. Were it not for the effort of your hard working team of ladies I would still be tearing boxes apart. Their work was both well coordinated and fast and my only regret is that I did not book them for an extra half day. I will recommend The Finishiing Touch to all my colleagues. Could not have done it without your excellent team. Absolutely exceeded all expectations - won't be able to move wiithout you again. Defintely made the whole moving experience easy & stress free. Lovely to be able to go to bed with everything in place. 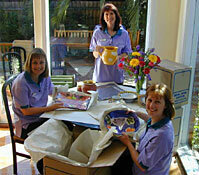 The team were such a delight to have around & really made our house into a home. Thank you! You guys really went the extra mile! With the removal company being over 3 hours late you still stayed and unpacked. Thank you for the compassion. Being in a wheelchair I could not have done it without you. Thank you. Wow yet another move over. Thank goodness for the "heavenly Helpers" Well done to your team Vanessa. I qualify for a job at Finishing Touch! The ladies that came in were fantastic! They used common sense and didn't need guidance. They left my house looking stunning and far exceeded my service. Will definitely be using in the future and telling friends and family. Thank you. We were delighted that such lovely people placed everything in such practical places for everyday use. It was of such great assistance in making us feel "right at home." Very personable and efficient staff. Has made the relocation from Australia relatively easy. With 2 small children it would have taken us weeks to do what the team did in a few hours. Thanks very much! Brilliant! Fantastic! Excellent! Best thing we could ever have done when moving house. Ladies were fantastic. Just got in there and got on with it. I was blown away. Felt and looked like we'd been there for weeks when they had finished. Thank you. Telling everyone about you. This service makes all the difference. I have moved many times and have never experienced such a smooth transition from one place to another. It is an exceptional experience. The ladies worked very hard and it wasn't until after they left when I was using the kitchen that I fully appreciated what a great job they did in actually THINKING about the most practical, logical way of placing all the items, I am very happy with the work. Thank you. Their skills were great, their attitude was exceptional and the outcome of their organisation brilliant. Deeply appreciated their flexibility & ability to be creative yet always in reference to what will work for the client. They knew their job and did it effortlessly & with humour, courtesy & understanding. Thank you Jeanette & Julie! Lovely ladies and most importantly, I have found everything that they put away to be neat, tidy and in its' logical place - many thanks. And the flowers are lovely. Thx girls! Jenny and Susan took the stress out of our move completely. Organised cupboards virtually perfectly and achieved an enormous amount in the time they were here. Even helped to hang mirrors! Highly recommended. I am already singing their praises to friends. Considering that I was out of town that day it was great coming home to an orderly kitchen, bedroom and lounge when I wasn't there to direct any of it. What a life saver! We have already recommended yourservice to others. We will be passing your card onto someone in charge of organising moving within our company. Thank you so much. I called them 'our angels' amd I still do, wonderful service, very happy. AMAZING. Simply the best thing anyone can have to settle into their new home. Thank you for the efficiency, friendliness and attention to detail, Jeanette and Hilda were wonderful! It was the best money I have ever spent on myself! The girls were wonderful and sorted out my boxes quickly and efficiently. My cupboards look wonderful! The job would have taken me months to do on my own! Thank you from the bottom of my heart. The staff were warm, friendly and treated me as if I was their loved family member. I have not had to change a thing in the kitchen. We were very impressed with your team and have been singing their praises to everyone we know. We have never had a move go so smoothly or seen packers who work so efficiently. We have given your contact details to the building manager at Phoenix, and I am sure he will pass them on to others who are moving. Thanks to you and the team for a fantastic job. As a New Kiwi, the first move I did all on my own. Four days of packing hell, followed by three weeks of unpacking limbo. On my second move, Jeanette and Julie from Finishing Touch came and took all my moving cares away. Friendly, efficient, and all done in two hours. This time around, it was a no brainer to get them back. What a great service and what a wonderful bunch of ladies on staff. Thoroughly happy and will only ever pack with Finishing Touch. An absolutely incredible service. The ladies were friendly and extremely professional. We were amazed at what they achieved in 4 hours. They unpacked, vacuumed, offered advice - AWESOME. Excellent. Midge was fantastic with such good ideas. It was much more than I hoped - Midge even made my bed for me to collapse into later. She was outstanding - quick, careful and a real God-send. Getting so much completed in 4 hours. The ladies were fantastic! Like having 3 mothers in the house! I have never used this service before and would recommend it and already have to my friends. Made a stressful experience with 3 young children much more pleasant. I found Kathy Weaver friendly and enthusiastic. She was able to offer us local information and recommend places to go whilst living here. She was friendly and approachable toward my two young boys and worked hard to achieve a lot of unpacking in a short time. Ladies were delightful - everything put away perfectly - best service we have encountered. Thanks for attention to detail. Made the move less stressful - happened all in one day, not over several. Also the ladies looked for ways to help. Much appreciated! Very impressed! Absolutely brilliant - fantastic - worked around the kids. Logical, organised, moving all the time. Just the best.